Prior to the Summit, we released a range of resources to support participants as they prepared for the Summit. These resources provided background and information on CTE, and prepared participants for the interactive nature of the three-day event. In 2009, Advance CTE (as NASDCTEc) held a similar event, convening our members to identify a new vision for CTE, resulting in Reflect, Transform & Lead. 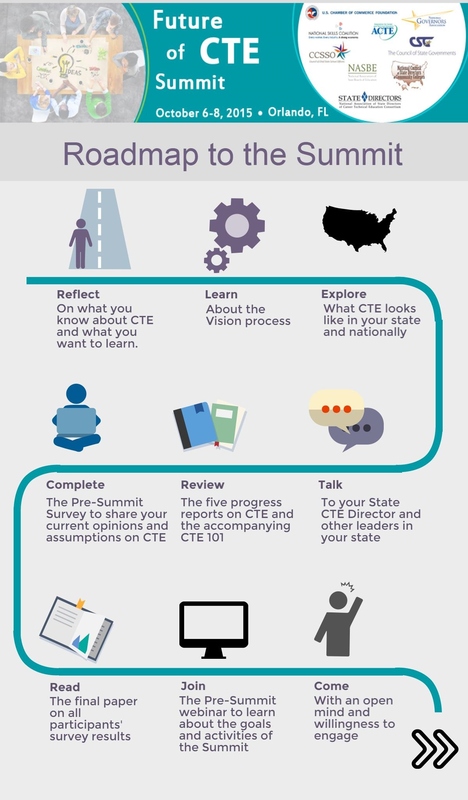 The 2015 Future of CTE Summit is unique in its co-conveners and intentional engagement of a wider array of CTE stakeholders and state and national leaders, but we will use the same visioning and consensus-building process as in 2010. To learn more, you can visit the 2010 Summit website (login required - username: NASDCTEc and password: cc4t3E2! ).